1. 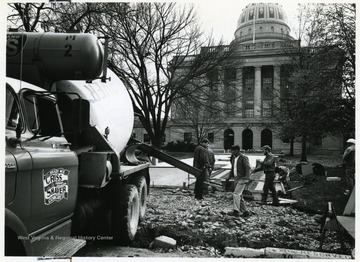 Pouring Concrete Walkway in Front of the State Capitol Building in Charleston, W. Va.
Pouring Concrete Walkway in Front of the State Capitol Building in Charleston, W. Va.
Workers lay concrete outside the capitol building. 2. Audia, Tony of Clarksburg, W. Va.
Audia, Tony of Clarksburg, W. Va. 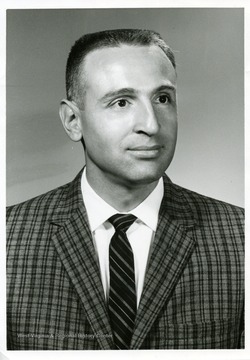 Portrait of Tony Audia of Penn Mutual Life Insurance Company in Clarksburg, West Virginia. 3. Graduates of St. Joseph's High School, Martinsburg, W. Va. 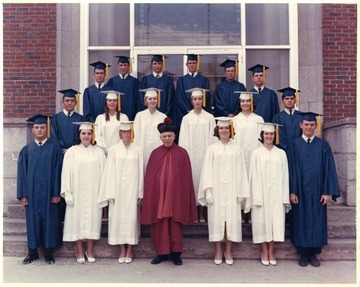 Graduates of St. Joseph's High School, Martinsburg, W. Va.
Group portrait of students in caps and gowns. 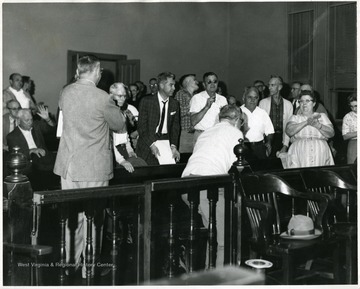 John Piccolomini is standing in the third row. 4. 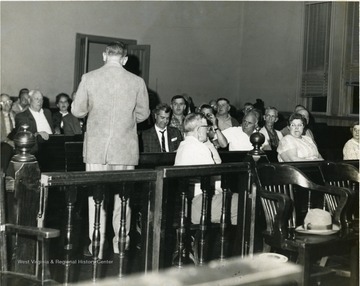 Courtroom Scene in the Old Courthouse, Morgantown, W. Va. Courtroom Scene in the Old Courthouse, Morgantown, W. Va.
William Delardas giving addressing crowd in the old court room in Morgantown, W. Va.
5. 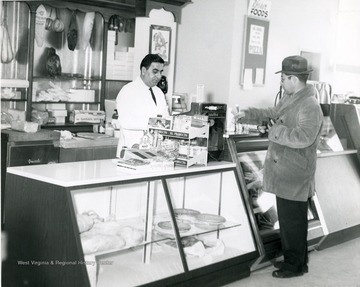 Interior of Sam George's Gourmet Shop, Morgantown, W. Va. Interior of Sam George's Gourmet Shop, Morgantown, W. Va. Located in the Suncrest Shopping Plaza in Morgantown, W. Va. Sam George in white behind counter. 6. 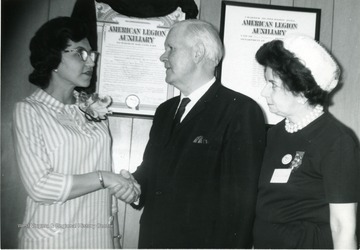 American Legion Auxiliary Members with Harley Staggers, Morgantown, W. Va.
American Legion Auxiliary Members with Harley Staggers, Morgantown, W. Va.
7. 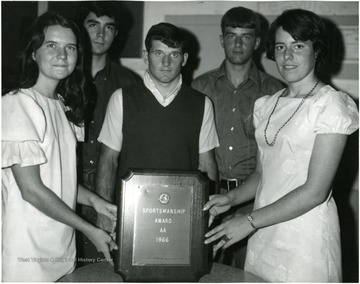 Scout Leaders at Award Ceremony, Morgantown, W. Va. 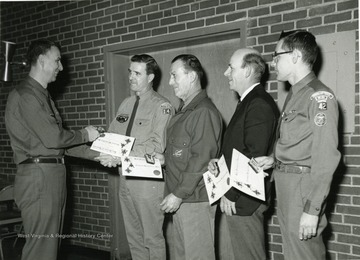 Scout Leaders at Award Ceremony, Morgantown, W. Va.
8. William Delardas Addressing Crowd in Old County Court Room, Morgantown, W. Va.
William Delardas Addressing Crowd in Old County Court Room, Morgantown, W. Va.
9. Bowling a Perfect Game Poster, Morgantown, W. Va. 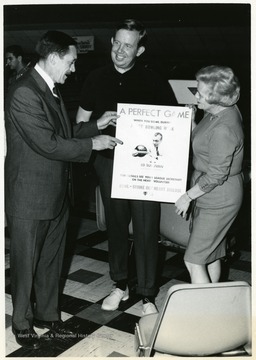 Bowling a Perfect Game Poster, Morgantown, W. Va.
Terry Thomas and Jack Fleming with an unidentified woman at a bowling alley. 10. 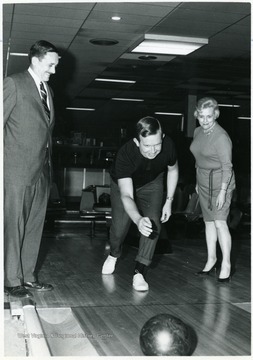 Bowling, Morgantown, W. Va.
From left to right the two men are: Terry Thomas and Jack Fleming. 11. 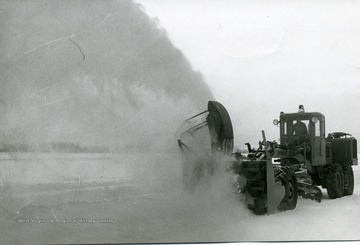 Snow Blower, Morgantown W. Va. Snow Blower, Morgantown W. Va.
Clearing a road in Morgantown, W. Va.
12. Webster Springs High School Students Pose with Sportsmanship Award, Webster County, W. Va.
Webster Springs High School Students Pose with Sportsmanship Award, Webster County, W. Va.